Jewelry artisan Ying crafts this bracelet by hand. For this design, she frames a cylindrical agate with facetted glass set in metallic cylinders. She completes the design with silver beads handmade by hill-tribe artisans. 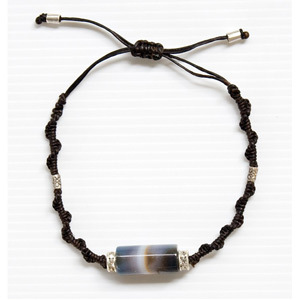 The bracelet length can be adjusted by sliding the waxed nylon threads. 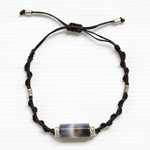 Materials: Agate, waxed nylon, glass and silver (.950).